Ancestry killed their African breakdown! I will never trust DNA tests again! Ancestry’s ethnicity estimates have become more accurate! I want ethnic labeling instead of country labeling! Only your DNA matches matter! Ethnicity Estimates are just for fun and the masses! I was able to verify (by using my scanning & filtering method) that all persons who suffered a dramatic decrease in “Nigeria” amounts do each have several Nigerian DNA matches. The Jamaican person possibly even has 20 Nigerian matches! Even for the Cape Verdean person I managed to find one possibly Nigerian match: most likely a Hausa-Fulani. See footnote 2 for a full overview of the African DNA matches for each one of these persons. Reaction 1: Judging too rashly? My 2 cents: These are in fact quotes by myself In this blogseries I have made a conscious effort to be as fair and balanced as possible in my assessment. Attempting to point out any improvements or positive features whenever I came across them. Despite my disappointment and even anger about Ancestry’s update. I must admit however that possibly I may still have overlooked a few redeeming aspects in my previous discussion. My 2 cents: It is sometimes said that your DNA results are only as good as the next update. After all they are just a snap shot of how your DNA compares with the reference samples in Ancestry’s current database according to their current algorithm. Nothing more but also nothing less! Your ethnicity estimates are not intended to provide the full and final answer to your ancestry. This is not a bad thing in itself. Given scientific advancements and a greater number of relevant reference samples hopefully a greater degree of accuracy may be obtained in the near future. Discrepancies when comparing DNA results from different companies/websites again are to be explained by differences in algorithm, different databases of reference samples and different labeling rationale of categories. Correct interpretation and awareness of inherent limitations is always a must. But you can indeed gain useful insight as long as you judge each case on its own merits! When deciding which DNA test to choose I personally always go by how well people of verifiable background are being described as well as historical plausibility. Aside from reviews by the “pundits”. I am a guy who prefers to see the glass as half full rather than half empty. Maintaining a critical stance but at the same time I aim to maximize informational value despite shortcomings. Also by way of combining with other insights. DNA testing might indeed be an infant science. But I find it amazing how much it has already developed. I feel it’s very encouraging also to see how many possibilities are available now to explore the African roots of the Afro-Diaspora. When previously this seemed almost like a hopeless endeavour! My 2 cents: Don’t be too trusting of Ancestry’s marketing hype! In part 2 of this blogseries I have argued that: More is not always better. It is not only the number of additional samples which matters but also their relevancy and how well they fit in Ancestry’s Reference Panel. Additional samples being a means to an end. But coherent regional scores in line with historical plausibility and/or verifiable genealogy should remain the main goal! The same thing goes for Ancestry’s new algorithm which might be well-suited indeed for people of well-defined origins. But for people of more complex origins it may be less appropriate in many cases. This goes especially for the Afro-Diaspora! When it comes to prior expectations of DNA testing of course everyone is entitled to have different preferences and ideas about their ancestry. All of us might be both thrill-seekers as well as truth-seekers to some degree 😉 It might be well-advised however to be honest to yourself about exactly which motive has driven you to take a DNA test. As your preconceived notions will influence how you will judge your DNA results. And also how you feel about this update. Do you want DNA results that more or less reflect your true ancestry or do you want them to reflect what you wish to be? Reaction 4: Too emotionally attached? My 2 cents: it is perfectly rational why Afro-Diasporans are so much invested in their DNA results! After all, aside from adoptees, they are arguably in most pressing need of finding out their ancestral origins because of the whole aftermath brought about by Trans-Atlantic slave trade as well as slavery itself in the Americas. This is no trivial matter as it may be for other people who are taking DNA tests! And it is certainly not something to be played around with by companies who seem to severely underestimate the wider impact of the product they are selling. Naturally people should be well informed about the limitations of DNA testing. And in fact many people are aware that these results are mostly to be taken with a grain of salt. Still also useful insight was already to be obtained, given correct interpretation. As I have argued many times now the previous African breakdown on AncestryDNA provided a valuable tool for Afro-Diasporans, despite shortcomings. And when Tracing African Roots you’ll need every tool you can get! However with this update a promising avenue has been largely dismantled. Sure, updates always bring along changes. One hopes for refinement and improvement. But when instead everything seems to be switching and flipping around completely of course people are going to be upset and even insulted! My 2 cents: understandably many people desire to have the most specific degree of resolution when searching for their African roots. They want to be able to pinpoint their exact ethnic origins and preferably also know the exact location of their ancestral village. In a way following in the footsteps of the still very influential ROOTS author Alex Haley. Unfortunately these are rather unrealistic expectations to have in regards to DNA testing (at least in regards to admixture analysis.). Not only given current scientific possibilities. But also because such expectations rest on widely spread misconceptions about ethnicity, genetics, genealogy as well as Afro-Diasporan history. Too often people ignore how the melting pot concept is really nothing new but has always existed, also in Africa! On the other hand ancestral categories referring to ethnic groups might be just as deceptive or even more so! As many people will again tend to take them too literally. Underestimating not only the sheer number of ethnic groups existing in Africa (thousands!) but also the complexity of interplay between fluid ethnicity, overlapping genetics and shifting political borders. The same goes for precolonial African kingdoms which again were not static entities. But instead very often ended up being multi-ethnic after expansion and assimilation of neighbouring peoples. Either way for such an endeavour to succeed one should preferably use ancient samples from relevant time periods and locations. Rather than modernday African samples whose pedigree may very well include many inter-ethnic unions within the last 200-300 years or so. Of course the intermingling of African ethnic lineage continued even more so within the Afro-Diaspora. Again during several centuries but this time also involving ethnic groups geographically far removed from each other. All of which resulting in a very intricate mix which remains tricky to disentangle. Is it possible to pinpoint a plausible ethnic origin for one’s African bloodline? What can be learnt from AncestryDNA when trying to trace African ancestry? Reaction 6: Overfocused on DNA matches? My 2 cents: I like to stress that I am in full agreement that African matches indeed hold a great importance in Tracing African Roots! They are often highly indicative of specific African lineage along one particular family line. And also enabling meaningful contact to real people/family from Africa! So I myself also definitely would recommend people to put in more effort in finding their African DNA cousins! My concern is more about why limit yourself to just one type of information source? As my research approach has always been about complementarity and combining of insights from various fields. Instead of putting all eggs in just one basket. Not all your African matches will be “identical by descent” (IBD). Especially the smaller-sized matches might often be false positives or “identical by state” (IBS). Ancestry’s customer database is not perfectly representative of all your possible African lineage. Certain African nationalities being over-represented due to greater migration presence in the US or UK. Each individual African DNA match will only be informative of one family line out of potentially hundreds others! Such a finding might be very valuable in itself but can never give you a total overview of your complete ancestry as given in proxy by Ancestry’s ethnicity estimates. There might be a higher likelihood of your African DNA matches reflecting mutual ancestors from the early 1800’s and late 1700’s. While there might be a built-in bias (due to the matching threshold) against African ancestry which is to be traced back to the early 1700’s, 1600’s or even 1500’s. Your mutual ancestor may not per se have been of the same ethnic background as your match. I find that the occurrence of inter-ethnic mixing within African societies and also among your own African ancestors is often underestimated. My 2 cents: variations of these opinions quoted above are voiced in particular by genetic genealogists, incl. several influential bloggers.4 I do not agree with their main message, which I feel is too discouraging and even condescending at times. Although I do think some of their objections and admonishments have been valid indeed. I have always seen admixture analysis as providing complementary information to be combined and contrasted with other information sources in order to possibly verify or at least reach more solid ground regarding one’s ancestral background. These other sources being (in no particular order): IBD matches, genealogy, population genetics, haplogroups, relevant historical context, cultural retention, family traditions etc..
Obviously all this information needs to be interpreted correctly and one must be aware of inherent limitations. But personally I would not want to rule out any information source in advance due to some blind spot or bias. 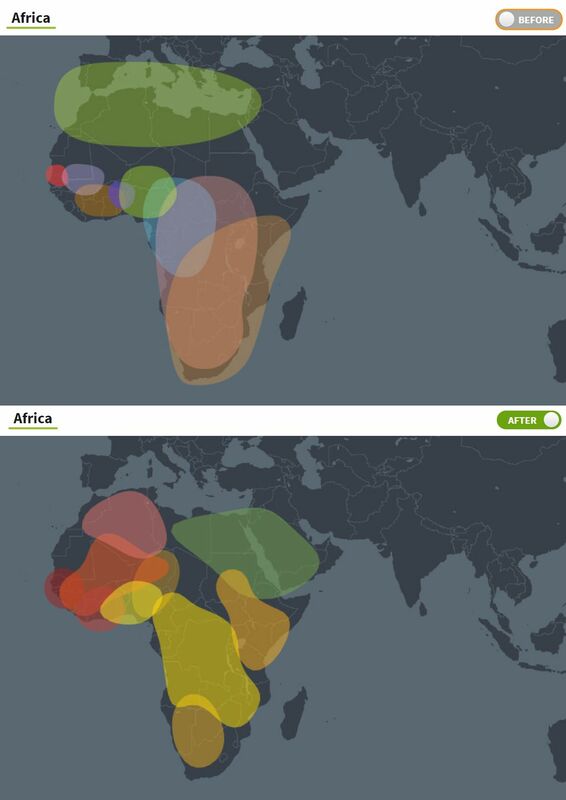 Ancestry’s arguably failed update for the African breakdown should not be used as an excuse to undermine the potential of admixture analysis in my opinion! Even more so when Ancestry’s latest update has resulted in helpful improvement for the European and Asian breakdown in many cases. 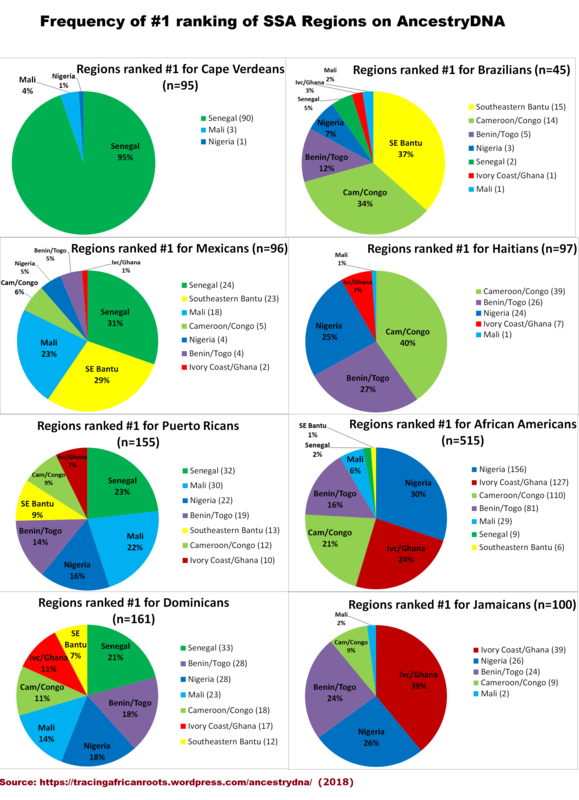 African Americans and Jamaicans with top ranking scores for either “Ivory Coast/Ghana” or “Nigeria” could be pretty sure already of having substantial roots from respectively Ghana/Liberia/Sierra Leone or Nigeria. The “Senegal” region was very useful in singling out predominant Upper Guinean lineage. In particular for Cape Verdeans and Hispanics but also for example for Hausa-Fulani from Nigeria. Brazilians and Haitians were able to assess the relative weight of either Yoruba and related Bight of Benin lineage versus Angolan/Congolese/Mozambican lineage. By looking into their scores for the reasonably predictive regions of “Benin/Togo” + “Nigeria” and “Southeastern Bantu” + “Cameroon/Congo”. These outcomes may not be pinpointing exact ethnic lineage or exact ancestral locations. But I would argue that such subcontinental resolution still represents very valuable information! Given that usually Afro-descendants do not have the privilege of being able to fall back on paper trails when wanting to learn more about their African origins.8 Because of this lack of viable alternative Afro-Diasporans cannot afford to be particular about the imperfections of admixture analysis. Instead I would argue for judging each aspect of DNA testing on its own merits. In a constant attempt to maximize informational value despite shortcomings (which do need to be properly accounted for). Basically taking any promising lead we can get and combining with other clues. Seeing the glass as half full and not half empty. Rather than be overcritical and risk loosing out on helpful information, even when only approximate or incomplete. Of course the tricky thing with admixture analysis for Afro-descendants is that there is usually no independent means of verifying the accuracy of their personal results. However during my AncestryDNA survey I found that on a group-level you can already roughly try to corroborate by comparing with how Africans are described when being DNA tested. A second way of (approximate) verification consisted of looking into possible correlation between the group averages of DNA tested Afro-Diasporans and historically documented slave trade patterns. From my findings verifiable regional roots for actual Africans were often indeed roughly confirmed by the previous version of Ancestry’s African breakdown. Also my survey of selected parts of the Afro-Diaspora was largely a confirmation of historically documented African origins for each nationality. Again such potentially profound information is not something to carelessly brush aside when wanting to Trace African Roots! Source: Ancestry. These maps show the 9 African regions available on AncestryDNA, before and after the recent update. Who knows how many African regions will be created in the next update? “Currently, we are working to further expand our global reference panel for future ethnicity updates. We have already begun genotyping and analyzing samples for a future update which we expect will provide even better estimates. We have also begun a new diversity initiative to gather DNA samples from underrepresented regions around the world in order to expand the number of regions we can report back to customers.” (source: Ancestry’s White Paper, 2018, p.33). “Simultaneously, we are also working to improve our algorithms for ethnicity estimation. Future ethnicity updates may include an improvement to our statistical methodology that will more fully leverage information in genetic data to reveal even more information about population history.” (source: Ancestry’s White Paper, 2018, p.33). Caution is warranted of course. One wonders for example how much time will pass till this next update will be available? Again five years?? Also which specific African populations will be targeted by Ancestry’s new “diversity initiative”? Now more than ever relevant African samples are needed! Producing coherent regional scores in line with historical plausibility or even verifiable genealogy for people of African descent. In particular new samples are needed from Angola, Burkina Faso, Guinea Bissau/Conakry, Liberia, Madagascar, Mozambique and Sierra Leone. For the already existing regions (“Senegal”, “Ivory Coast/Ghana” and “Nigeria”) a more balanced distribution of sample size should also be realized in order to avoid the current flaws. Living DNA, working with the world’s leading academics, scientists and genealogists are seeking your help to extend the level of genetic detail within the West African region, which includes today’s countries such as Gambia, Sierra Leone, Liberia, Senegal, Nigeria, Chad, Cameroon, Guinea, and Mali. Follow this link for more details. Another very promising development is taking place with a new DNA testing company called: Living DNA. Something which I hope to be covering in greater detail in the near future. The above map is taken from their West African project page. It looks very ambitious to be honest but even if only half of the intended resolution will be achieved this could be MAJOR! 2) This screen shot featuring the updated results from 4 different parts of the Afro-Diaspora (Cape Verde, Haiti, Jamaica, USA) is quite telling for several reasons. Previously you could more or less distinguish historically plausible African regional patterns for each nationality (on a group level, see this link). This is mostly no longer the case because of the way the African breakdown has become much more generic after the update. The European scores are now however more in line with expectations based on colonial past. Take notice especially of the new regions for “Portugal” and “France”. Because I was given access to their profiles I was able to analyze the DNA matches for these 4 persons on Ancestry and single out possibly African ones by using my scanning & filtering method. Going by plausible regional combinations, African surnames and other relevant profile details. Actually I had already performed the same exercise one year ago for two of these persons: the African American and Cape Verdean (see this blog post). And I have found a considerable increase in their African DNA matches. A very encouraging indication of how DNA testing among Africans has become ever more popular! As can be seen from the overview below all persons who had their sometimes very high “Nigeria” amounts practically wiped out do still have several Nigerian DNA matches. Greatly indicative of actual Nigerian lineage! Intriguingly also for the Cape Verdean person possibly one Nigerian match showed up. But most likely because of shared Upper Guinean/Fulani lineage. The other Fula matches are all likely to be from either Senegambia or Guinea. Actually non-Fula Senegambian/Guinean matches far outnumber any possibly Malian matches for Cape Verdeans as I will demonstrate in an upcoming blogpost. African American: 5 most likely Nigerian matches; 1 possibly from Ghana, 1 possibly from Sierra Leone. Cape Verdean: 4 most likely Fula matches; 1 possibly Hausa-Fulani; 3 North Africans. Haitian: 4 most likely Nigerian matches; 1 from Angola; 1 from Malawi; 1 possibly from Ghana; 1 possibly from Sierra Leone. Jamaican: 20 (!) most likely Nigerian matches; 4 possibly from Ghana; 2 possibly from Liberia; 2 possibly from Senegal and/or Gambia; 1 possibly from Togo. 3) Let’s consider a hypothetical case whereby an adoptee who was raised by two African American parents took a test with Ancestry last year. He considers himself to be African American as well. But actually his birth parents are both from Africa! His father being Nigerian (Igala, to the north of Igboland) and his mother from Uganda (Bari, a Nilo-Saharan people). Now going by the African breakdown of last year he might still have received a reasonably decent “Nigeria” score of around 20-40%. While his Ugandan side would have been predominantly described by a distinctive score for “Southeastern Bantu”, let’s say around 40-45%. Of course not a perfect reflection of his pedigree due to the very likely appearance also of additional secondary or trace regions. But still quite indicative when interpreted correctly! By comparing with other African American results he would quickly find out that his breakdown is quite atypical: 1) for being 100% African 2) for having such a high “Southeastern Bantu” score. With proper follow-up research these two clues might already lead him in the right direction. However when only relying on DNA matches the impression of his African lineage will be incomplete & disproportionate. Due to the composition of Ancestry’s customer database his DNA matches overwhelmingly will be African Americans (hundreds if not thousands!) who will share Nigerian ancestry with him. Probably also his closest matches will all be African American. Next in line will most likely be West Indians and other Afro-Diasporans who again will have Nigerian DNA in common with him. If he performs a thorough search he will probably encounter some Nigerian matches as well. If he’s lucky perhaps even a few dozen or so. However a majority of them will most likely be of Igbo descent rather than Igala. Because they are neighbouring people these two ethnic groups do share a lot of genetic similarity, resulting also in mutual DNA matches. But due to a greater number of Igbo migrants in the USA/UK they will also tend to be overrepresented among Ancestry’s customers. DNA matches to be associated with his Ugandan side are quite unlikely. Ugandans being very rare in Ancestry’s customer database, unlike Nigerians. Perhaps he might get a few puzzling Middle Eastern matches though, due to the Arab slave trade reaching into Uganda. Just going by these DNA matching patterns and not knowing his ethnicity estimates he will probably not suspect he has been adopted. After all his main DNA matches will be African American! He will have no reason to assume he is anything else than African American himself as well. Going by the much smaller number of Nigerian matches he might assume he has Igbo lineage by way of the Trans Atlantic Slave Trade. Even when in reality his Nigerian lineage is much more recent, and not Igbo but rather Igala. In the absence of any Ugandan matches he will remain completely in the dark about his maternal side! Of course this is just one hypothetical example but it might illustrate the added value of combining insights from different aspects of DNA testing. Rather than only focusing on DNA matches. The assumptions being made about the composition of Ancestry’s customer database are based on my ongoing analysis of DNA matches being reported for African customers on Ancestry. I intend to blog about these findings eventually. Actually in an upcoming blogpost I will already explore the correlation between admixture and DNA matches for 50 Cape Verdeans, as reported by AncestryDNA. 4) For an overview of blog articles discussing the usefulness of admixture analysis, see heading “Blog Posts” in this ISOGG entry: Admixture Analysis. On the other hand I find it unjustifiable to paint all first-time DNA testers with the same brush. Also I would find it rather paternalistic if for example the choice to no longer maintain a continental breakdown on AncestryDNA was motivated by such concerns. A few months ago I blogged about bringing back the continental breakdown within Ancestry’s Ethnicity Estimate display. With subtotals specified for each continent. This used to be standard until it was changed about a year ago without any explanation why (as far as I am aware). Right now the display merely shows you a seemingly haphazard listing of regions sorted from biggest to smallest amount, regardless of continent. This creates a lot of inconvenience for people who are also interested in knowing their continental percentages. This is especially relevant for Afro-Diasporans given their generally admixed genetics. 6) Without wanting to be divisive I do find it noteworthy how the ethnic backgrounds of each of these bloggers seem to often determine their outlook on admixture analysis. Perhaps not that surprising given that their evaluation will be based mostly on how their own DNA is being described. Nothing wrong with personal reviews. But I do think that people of African descent should realize that their predicaments are not the same as those of bloggers of fully European descent. Generally speaking I suspect some degree of ethno-centric bias is quite likely to influence how people will judge the usefulness of admixture analysis. Again not trying to be accusatory or anything. Because I believe I could very well be guilty of such bias myself as well! I am of both Cape Verdean and Dutch descent. My blogging interests are more wideranging. After all I am focused on covering the entire Afro-Diaspora and also regularly discuss African topics. Still my own specific background may (consciously or unconsciously) direct me in certain ways. I guess what I’m trying to say is when deciding on the usefulness of admixture analysis don’t let other people, social media, genetic genealogists or even bloggers (myself included 😉 ) dictate your choices! Do inform yourself properly but make up your own mind based on facts relevant to your own situation rather than on sometimes subjective opinions. 7) Sometimes it almost seems that admixture analysis is being considered mere guessology by its fiercest critics. Or only fit for cocktail parties as the saying goes 😉 This has however not been my experience. I do agree that performance among the various DNA testing companies and third party websites is very variable. And obviously even more so going back in time. I have myself only tested with 23andme and Ancestry and I found that with correct interpretation and knowledge of their methodology you can derive useful information from their ethnicity results. Which were of course not just pulled out of a hat. I know of many people who made important discoveries about their genetic ancestry by using ethnicity estimates. For example I have heard several stories by West Indians who had unexpected Asian admixture, minor but still substantial (say >10%). And this information was really useful to them as it lead them to previously unknown Asian contract labourer ancestors. There are plenty of other ancestral scenarios for Afro-Diasporans which can be illuminated by way of the continental breakdown which is usually quite accurate. The regional or subcontinental percentages are indeed not to be taken all too literally. But again I know several persons who relied on distinctive regional scores to make a breakthrough in their ancestral quest. For example I have been told about at least three instances of NPE being confirmed whereby the father turned out to be East African instead of African American or West Indian. In one case indicated by the very predictive “East African” category on 23andme but also by a singular combination of “Southeastern Bantu” and “Middle Eastern” regional scores on AncestryDNA. Many times I have also seen how unexpected partial Cape Verdean lineage could quite reliably be corroborated by “Senegal” scores on AncestryDNA. Not only for African Americans, but also for Hawaiians (due to whaling connections, see upcoming blogpost)! 8) The very low odds of tracing back to Africa for African Americans were highlighted last year during an episode of Finding Your Roots by Henry Louis Gates Jr.. The guest of his show, musician and producer Questlove, was found to be descended from one of the last enslaved Africans to arrive in the US on a slave ship. This certainly was a very remarkable and precious finding! But such a verifiable paper trail leading back to Africa must be extremely difficult to reproduce for ordinary African Americans. For one thing they will not be assisted by professional teams of historians and genealogists. Furthermore this finding only concerns one particular family line (relatively recent) among possibly hundreds of others. All individually to be traced back to several parts of Africa! How is a layman expected to ever uncover a majority of these lines, let alone one single one? This (near) impossibility of the genealogical route for me underlines once more how there is a lot more at stake for Afro-Diasporans when taking a DNA test than for people with plentiful documented knowledge about their ancestral origins. 9) Aside from the increase in African sampling it is also noteworthy that Ancestry seems to have plans to possibly provide two versions of their ethnicity estimates. Aside from relatively recent origins also aiming to describe “ancient genetic origins”. This could be very insightful and might reconcile the demand for bringing back trace regions (often reflecting “deep ancestry”) with the need for maintaining the current more condensed breakdown. I am guessing perhaps different algorithms will be applied to reflect geneflow to be traced back to (very) ancient time periods versus geneflow from a genealogically meaningful time period (~ 500 years). I suppose similar to the various calculators available on Gedmatch but hopefully with explicit context given about underlying assumptions, implications etc..
10) Just to add to my suggestions for improvement I blogged about a few months ago (see this link). It seems prudent to me that already existing African customers should be actively engaged and stimulated to fill in their family tree details or atleast provide places of birth in Africa. This would help tremendously for Afro-Diasporans wanting to connect with their African DNA matches. Plus it may also facilitate the recruiting of new African samples for Ancestry’s Reference Panel. Another potentially very helpful suggestion might be to enable DNA matching with all the African samples contained in Ancestry’s Reference Panel. Possibly also to be combined with Ancestry’s migration tool. Creating new African genetic communities as I have already blogged about earlier. Thanks again. A lot of thoughts to consider in this breakdown. Do you know when the new 23andMe breakdown will be rolled out? I don’t see that reflected in my results yet. The only thing I know for sure is that customers on older chip versions will have to wait a while. According to this source however it could be a couple months away still! Is it normal for African Americans to have high amounts of senegambian? In this new update, they have decreased. Mali went from 12% to 3%. Senegal went from 3% to 1%. Mali seems to increase for everyone, while mine has dropped. One of the senegambian cousins is from the states I believe, but his fathers from Senegal. The other is from the capital of Gambia. Yes from what I have seen it is quite common for African Americans to receive Senegambian DNA matches. 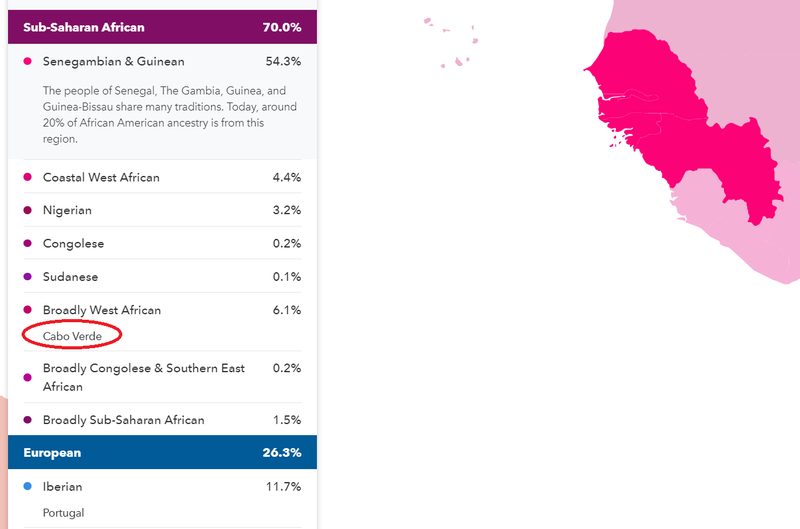 In case you like to have a second opinion for your approximate proportion of Upper Guinean ancestry you might want to consider also testing with 23andme. I have not seen that many updated results yet to be frank. But just going by a couple of Cape Verdean updated results I have seen their new category named “Senegambian & Guinean” could be pretty predictive. It also really depends on what part of the diaspora you’re from. If you’re not African American, then it’s a whole different story. And even within the United States there are significant variation depending on where your family came from once they were brought here. My three test (me, my father and his mother) also all showed deceases in “Mali” and eliminations and near-eliminations for our “Senegal.” This does seem to be the exception to the rule. But again, it depends on where in the diaspora your trace your roots once our ancestors landed in their respective new homes. I’m actually thinking given that these are exceptions that they could perhaps be big clues as to which “Mali” and “Senegal” are now measuring and which groups they aren’t. I must admit, im abit dissapointed how the 23andme announcement update came august and now its october and my results are exactly the same…. no detailed african breakdown or anything. But yet i see all these people sharing all if their newest updates. Yeah it seems that rolling out updates has become more difficult for dna testing companies with all their millions of customers. They’ve become too successful it seems haha. Frankly i’m glad that oldtimers like me (i’m on the v2 chip) do not have to test again. Hi Fonte, what you mentioned on LivingDNA is interesting! Do you know how long on average it will take them to give me my results after I upload my raw data? I am curious to see the type of breakdown they will deliver. I have no experience with them, because their West African project is still under development. I’ve only seen two results yet featuring their current African breakdown which is VERY old school, haha. It only has “Yorubaland”, “Mandinka” and “East Africa”. Should be more or less equal to the macro-regional format i’ve been using of Upper Guinea, Lower Guinea and Central/Southern Africa. “As a thank-you for taking part in our research project, you will be able to find DNA matches with other people in the project as well as people who have taken a Living DNA test. De rien! I’m also very curious to see how it will turn out. This company is UK based and they originally only attempted to describe British DNA, but with amazing detail, about 20 regions i believe! For those with genuine British origins I’ve heard it is some times eerily in line with their known background. However because their analysis is so finely tuned it tends to see British DNA everywhere, also among West Europeans and even West Asians, lol. Man their project and what they are looking to achieve is incredible but…. lol I was also wondering how they were going to be able to make the distinction between Anyi, Baoule, Brong, and Ashanti, I mean we are the same people at core. It would have been simpler and more realistic if they’ ve put us under the Akan umbrella, the Bete/Guere/Kru within the same Kru group, and even the Bambara/Malinke under northern Mande (how are they going to be able to distinguish Bambara from Malinke I am just waiting to see this lmao) but seriously, I like how ambitious they are! I realize that redoing your research on Ancestry’s results from users for their African ancestry is probably a lost cause with the new update. But I’d be super curious to see an update on the diaspora’s European ancestry, since those region’s have been made more accurate on net, for instance, getting rid of all of the false positive “Iberian Peninsula” results. I was just thinking about this as I was looking through my father and his mother’s results. They both have a fairly unsual new region for African Americans: Baltic States. It’s centered on the three Baltic nations, but also includes northern/northwest Russian and some other Eastern European countries. Given that they both have small amounts and that my grandmother more than my father, I’m thinking this is not a false positive for this region. My grandmother, in fact, had had a Findland/Northwest Russian region in her previous update. Anyway, I imagine seeing a lot of my matche’s results that you’re going to get a lot of “England, Wales & Northwestern Europe” and “Ireland & Scotland” in the North American disapsora. But I’m really curious to see how well Ancestry now differentiates between Spanish and Portugese ancestry in the Carribean, and Latin America. Right now I am not intending to do a new survey based on updated Ancestry results for people of African descent. However I might blog about some updated European, Asian as well as Native American results eventually. Just to give an idea about the predictiveness of the new regions. From what I’ve seen sofar the “England, Wales & Northwestern Europe” is indeed predominant for AA’s as expected. I would actually really like to see some research being done to establish how strong any additional Irish ancestry might be for AA’s as well as West Indians. Now that the distinction seems to have become more reliable. Also looking into the regional scores for “France” among Louisiana Creoles and Haitians would be interesting. The new “Portugal” region seems very predictive for Cape Verdeans and Brazilians. But I feel that it is somewhat overstated for Hispanics. Genuine Portuguese lineage is indeed plausible for many Latin American countries because of both colonial and post-colonial migrations. However I would say not to the degree Ancestry is reporting right now. Quite likely genetic similarity with Galicians and southern Spain is now also being picked up by “Portugal”. The new “Spain” region doesn’t seem that solid to me. This also causes some inflated “France” scores for Hispanics actually. Just knowing the history of settlement in the eastern United States, I think the new “Ireland & Scotland” has indeed been corrected to a more realistically minor role. Even a lot of slave owners who were called Irish where mostly Scots-Irish, many of which ancestry had a lot of historical English DNA. Same for those of Scottish origin; a lot of lowlanders who had significant English ancestry. The migration of Irish Catholics came relatively later and they were poorer and way less likely to be slave owners, which is how most European DNA entered the African community. Even in the old update my Ireland/Scotland was very low (2%). As for Spain, it was WAY too expansive in the old version of Ancestry, being reported at ridiculous amounts among those of British background. So I guess maybe it’s now too small, but much closer to be more predictative of actual Spanish ancestry than the old version; that much I know. I was kind of surprised they split Portugal and Spain into two regions given that the Portugese aren’t really all that genetically distnct from the Spanish. There is a generaly east to west cline across the peninsula. So while western Spanish and the Catalans are the most distant on the Peninsula from the Portguese, they are all more similar than they are to other areas, mostly. As an example, the Irish are much more genetically distant from the English than the Portugese are to the Spanish. I’m also not surprised to find inflated France scores in Hispanics given that southern part of France isn’t all that distinct from the Spanish and Catalans. I was actually kind of surprised they made a “France” region given that, they too are not that genetically distinct from their neighbor. I can only really say about my results but they correctly identified 40% Portugal. They also gave me 9% Spanish. My ancestors were from Northern Portugal and probably more remotely also Galicia so it seems pretty accurate. Also they seem so correctly identify Northern Portugal as Portuguese and not gallego or Spanish. My girlfriend just took the test and got her results (so with the new breakdown). The results were incredibly accurate. Her father’s family hails from Benin and Togo (with family lore of distant Portuguese ancestry). She came out 49% Benin/Togo and 1% Portugal. The remaining 50% of the breakdown reflect her mother’s Northern/Eastern European heritage perfectly. I hope this can alleviate some of the diaspora test-takers worries. At least Benin/Togo seems to be very reflective of Benin/Togo ancestry. By “some” you must mean a “small amount.” Because most of the disapora has no idea of their African background for obvious reasons. Like, good for your girlfriend, but her group represents a very small amount of the African diaspora (relatively recent immigrants). That said, in the first part of this three part post, Fonte has found with limited samples that “Benin & Togo” does indeed match best with present day Africans from Benin, particularly Gbe speakers. But to reiterate, this update for both the disapora and Africans, the vast majority of whom aren’t of Gbe-speaking background, is pretty useless. And if you know one already knows they are of this background, this is of really no real use to them either. If nearly everyone is “Benin & Togo” than almost no one is “Benin & Togo.” It cheapens the usefulness of the region. Thanks for sharing! “Benin/Togo” might indeed be pretty accurate for many people of actual Beninese/Togolese descent. Although I am guessing ethnic background will still matter and people from the northern parts of those countries might get more varied results. Very interesting to hear about the family lore of distant Portuguese ancestry for your girlfriend btw! Is she by any chance related to any of the Aguda families? Yes, I see the problem now that you mention it, her case is just a lucky one, I didn’t know non Benin/Togo people had gotten those results too. As a matter of fact, her father has mentioned before that they have significant Yoruba heritage from across the border in Nigeria, which, I guess, could have justified some Nigeria percentage. As of her Portuguese heritage, the name I have heard mentioned is de Almeida (or Almeida) if I remember correctly. I just read the article about the Aguda. Very interesting story. I’ll ask her Dad when I see him. (sorry for the multiple posting). Now that I think about it, the Portuguese heritage is on the Fon-speaking side of the family, not the Yoruba, but that may not mean much. Hi! I have been following your blog since last summer when I first used ancestrydna. Thank you for all your work as it has greatly helped me in figuring out who I am. I was adopted and ancestrydna has been my way of figuring out where I am from. However, ever since the update, I have gotten more confused and was wondering what you would say as I’ve been searching and haven’t found a similar enough match to my results. I just find it strange the increase from 3% Mali to 46% and that Senegal is completely gone from my estimate. Even though 23andme is not that better, these recent results have been making me want to try them out and see how they say my dna estimate is. Thank you for your feedback! Have you been assigned to any migrations on Ancestry? 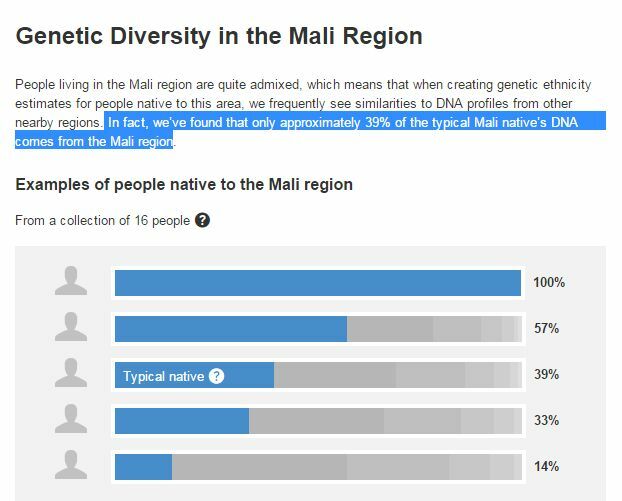 The reason “Mali” is now prevailing has to do with the disproportionate increase of Malian samples in Ancestry Reference Panel (see also part 2 of this blogseries). And probably also because of their new algorithm which tends to fit DNA in just a few single regions, instead of reflecting the underlying diversity. Your case seems quite illustrative of this! If you don’t mind me asking what have been your findings about your birth parents sofar? To be frank you have a rather distinctive breakdown. Taking it literally you would be inclined to say you might have one parent of Irish or Scottish decent while the other parent could be fully West African. Not per se from Mali but also any of the surrounding countries. I haven’t been assigned to any migrations. And I have only been able to see through distant cousins so far, which have primarily been from Irish descent, that one of my parents must have been primarily Irish or Scottish, but for my African side it is hard to tell as I haven’t found many matches on Ancestry or GEDMatch. I’m hoping to continue to learn more about DNA though to find out more. Thank you again for all your work as it makes some concepts of ancestrydna more understandable for me! What was the rest of your European ancestry in the previous version? I see you went from 35 Ireland/Scotland/Wales to 50% Ireland & Scotland. I’m trying to figure out what previous region was melded into your Ireland & Scotland. This is one region that stayed exactly the same for me. My only big European change was almost all of my “Iberian Peninsula” (9%) being given over to England, Wales & Northwest Europe; I only retained 1% “Spain,” but I think that shows that I do actually have some (distant) Spanish ancestry somewhere. It was 4% Europe East, 4% Scandinavia, and 4% Great Britain. These must have gone into Ireland and Scotland as it’s the only Europe part of my estimate now. Hey its me Caquetio from 23andmeforums (The half Aruban half Curaçaon guy), I have a question. If I want to dig deeper to finding out my African roots, which DNA test should I take? I’m still at V4 on 23andme and they updated their African breakdown for V5 people. But I heard that ancestry DNA is also very good. I used to recommend Ancestry but as argued in this blogseries the African breakdown on Ancestry has taken a major hit after their recent update… I do think you can still get your money’s worth though when ordering their test. But mostly because of the increased odds of finding African matches within their customer database. It will take another update to correct the damage they have done to the African breakdown right now. There are some promising developments ahead on Ancestry, 23andme as well as Living DNA. But right now a little bit of patience is still required see also section 2 of this blogpost. I went from 40% Malian to 8% with the recent update. and my Benin/Togo went from 4% to 29%! Cameroon, Congo and Southern Bantu went from 16% to 30%. This changes absolutely everything they told me earlier this year. @_@ Portuguese has also been added out of nowhere at 1%. Any idea what this means? Very drastic changes indeed! The new “Portugal” region also includes genetic affiliations with North African DNA so it might be that your former trace region of <1% “Middle East” has now simply been relabeled. The best way to find out more details is to do a systematic search among your DNA matches. Possibly (other ancestral scenario’s might also apply!) a Fula ancestor may have passed on this part of your DNA. LOL! Did you check out my new blogpost about 23andme’s update already? I will eventually also do a survey for AA 23anme results. But not right now as i have too much on my hands haha. Muito obrigada!! Thank you so much for this blog!! I am Brazilian and I have been trying to find my African ancestry for so long!! I have done MyHeritage, Ancestry, GedMatch, LivingDNA, FamilyTree… They each give me different results!! Ancestry gives me 27% cameroon/Congo and southern bantu, which seems super broad! But based on the data from Africans, does it mean I am closer to Congo and equatorial Guinea people? Please contact me! De nada! É um prazer! It’s true that each DNA testing company will give you different estimates. This can be confusing but also is understandable because they apply different types of algorithms as well as compare your DNA against different databases of Reference Populations. Even when ancestral categories have the same name they may still not be perfect equivalents. Because they will be measuring different types of genetic similarity. It is all about correct interpretation and being aware of the relevant context. As argued in this blog series the current African breakdown on Ancestry is regrettably not very helpful anymore. Because of its flawed framework. So I cannot say for sure what your “Cameroon/Congo and Southern Bantu” score is implying exactly. Nor can I tell you if it is proportionally speaking more or less a decent estimate. However going by historical plausibility of course Angolan as well as Mozambican lineage is always going to be very relevant for Brazilians such as your self! Where is your family from within Brazil? A great way of zooming into more specific sources of your African lineage is looking into your African DNA matches. Have you found any yet? I intend to set up a service for people wanting to get a full overview of their African DNA matches on Ancestry as well as how it correlates with their ethnicity estimates. So keep an eye out for that! Oh, something else to thank you about – I followed your instructions on finding African matches! I have matches that are 100% of African descent but they are American and Haitian, so not really very useful to find out more. We contact each other and neither has information! But it’s always nice to find our relatives around. I’ll be meeting up with one of my Haitian cousins this week! Coincidentally we are in the same city. Next step I guess is when I am back to Brazil I will get DNA samples from the rest of the family. I hope my grandmother will have many African matches. Oh, I am from Rio de Janeiro btw. But mom’s grandfather came from the Northeast (Pernambuco). The African heritage is from mom’s family. MyHeritage -> 10.8% Nigerian, 4% Sierra Leone, 3.7% West Africa, 4.8% Kenyan. My interpretation is that Kenyan is probably actually Mozambican, given the slave trade and the fact MyHeritage only tests for Kenyan, Massai, Ethiopian and Somali in East Africa. In the map Nigeria includes Northern Cameroon. This was also the lowest African estimate with only 22%. Not sure where they are assigning the rest, it’s interesting. LivingDNA -> 21.4% Yorubaland, 2.7% Mandinka, 11.6% East Africa. This follows the trend as mostly West Africa and some Eastern. Yorubaland is not actually Yoruba but includes Nigeria, Benin, Togo, Cameroon, Ghana and parts of Niger and Mali. Highest African estimate at 36%, apart from GedMatch. FamilyTree -> 23% West Africa and 3% East Central Africa. West Africa is a broad area but concentrated on Nigeria and Cameroon. Looking back on the regions across different companies and labeling the consistency I find is actually Cameroon/Congo region. So now I am inclined to believe my African ancestry is mostly from Cameroon and part from Mozambique. My mtDNA haplogroup is L3E1. In the European estimate the one that seems mostly accurate was MyHeritage. African ancestry though can be another story. How exciting about the Haitian match! I am sharing profiles with several Haitians and Brazilians on Ancestry and one striking thing I noticed is that they often match each other. Most likely on African DNA segments and to be explained by mutual regional origins from the Bight of Benin, Central Africa or even Mozambique. Not trying to influence your decision but you might want to give 23andme a try when testing your grandmother (very good idea btw to test older generations!). Given that you have already tried most other options. And very recently 23andme came out with a pretty decent update of their African breakdown, based on African 23andme customer results (see this blog post). From the Brazilian results I have seen sofar (about 20) it is quite capable to single out Central African DNA (see this spreadsheet).